Apropos of Doug’s post over at Balloon-Juice — on Fox’s latest defense of addiction, lung cancer and related afflictions as badges of Real ‘Murkin-ness — here’s a completely pointless appeal to actual data. I know that this won’t make a dent in the public discourse, but I get so damn sick of being told that my 53 years of coastal life are somehow hopelessly out of the common run. To recap: the Fox News (sic!–ed.) personage defending the Cain guy’s on-air nicotine jones argued that those living “real lives” (as opposed to my own transparently fake one) embrace the death and destruction that follow the trail of discarded butts. First on her list of such real Americans were farmers, as opposed to that terrifying scourge, the coastal elites. I’m a farmer’s nephew. I have [ineptly] driven a tractor as a summer hand, when that aforesaid uncle sucked it up, made nice to my mum, and allowed me to “help” him during the harvest. I’ve shoveled grass seed into sacks (equipped with just about the only farm implement I’m actually qualified to wield, a shovel). I got nothing but admiration for those with the gift or the capacity or the sheer stamina to farm for a living. For myself I’m desperately glad that after my teens, I never had to work that hard with my back and hands. In which expression of gratitude I am not alone. The actual farm population — working farmers, not folks who live on (relatively) big patches of ground — amount to a rounding error within the total US tally: one percent or less of American workers are farmers. Combining wheat or running cattle may be iconic. It just doesn’t occupy very many people anymore — at least not in any industrialized society. It’s been that way for a while. Rural life last claimed half of the US population more than ninety years ago. By the late 1990s, fewer than one million Americans claimed farming as their principal job. As of 1997, just 46,000 farms out of over 2 million listed accounted for 50% of all agricultural sales. That translates into the fact that no one — defined here as very few — actually fits the romantic image of the American family farmer anymore. That image of a spread large enough to support a family and small enough to be run by one has not entirely vanished into myth. But assuming, (generously) a 20% margin on sales, farm income at or above the $50,000 level flowed to fewer 10 percent of all farms, again in data from the end of the last century..
All of which is to say, as I did through all that 2008 blather about Sarah Palin’s ability to channel the experience of what was in fact a distinct minority of Americans, that Real Americans live in cities and suburbs. In fact, contra that Foxbot, half of all Americans live in coastal watershed counties. * We may not all be elite** — but there are a whole lot of us. *To be sure, for the purposes of that calculation, Detroit is a waterfront community. Remember: Duluth is America’s westernmost Atlantic port. **Though we are, of course, all above average. 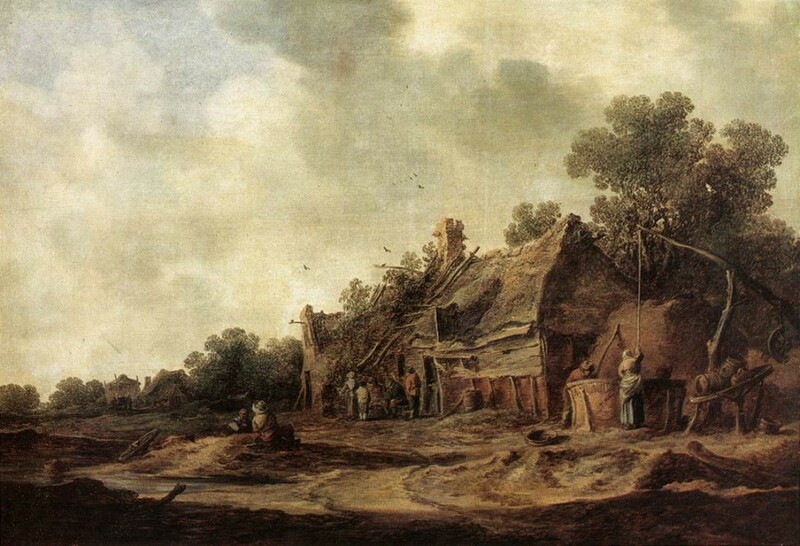 Image: Jan van Goyen, Peasant Huts with a Sweep Well, 1633. Categories: McCain, political follies, Politics, Stupidity, Who needs science? …But parody just can’t keep up with reality. (h/t Talking Points Memo). What gravels me (as long as we are making fun of senators) is, of course, the banal stupidity of the statement in question as well as the howlingly inappropriate inference one is forced to draw. Again — just a little bit of empirical effort please. Drilling for oil offshore or in ANWR will not affect prices at the pump, the mood of the collective American Family ™ nor our national security for years/decades to come. EIA said its projection is that ANWR oil production would amount to 0.4 percent to 1.2 percent of total world oil consumption in 2030. The figure is low enough that OPEC could neutralize any price impact by decreasing supplies to match the additional production from Alaska, EIA noted. That is: the oil addicts do not wish to confront knowledge fully in the public domain, data produced by one of the most pro-oil administrations in memory. *I can’t find a Youtube post to back me up on this — but I still remember with delight the Rocky and Bullwinkle show episode in which the marvelous moose is asked if he will accept a package from Paris, France, and he replies “Noooo. This is a family show.” One of many truly wonderful “I’ll explain it later, kid” lines from that program. 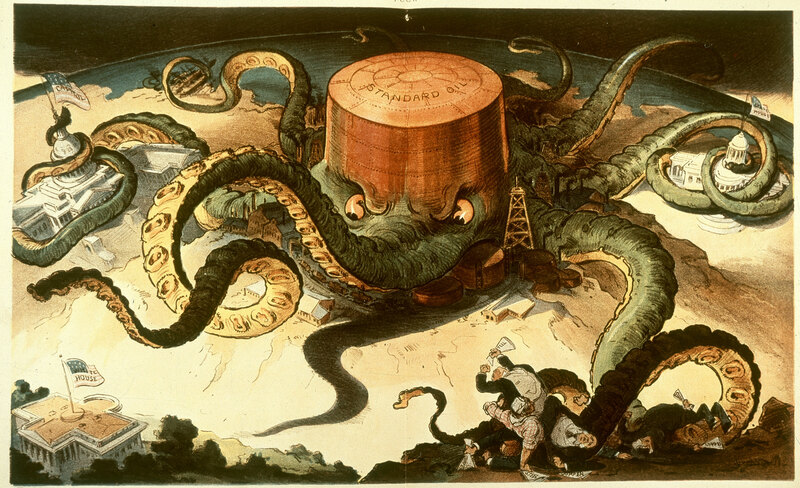 Image: With apologies for any likeness to PZ Myers, it’s the Standard Oil Octopus. Cartoon by Udo J Keppler for Puck, v. 56, no. 1436 (1904 Sept. 7). In the Library of Congress collection: http://hdl.loc.gov/loc.pnp/cph.3b52184 (b&w film copy neg.) cph 3a27007 http://hdl.loc.gov/loc.pnp/cph.3a27007. Source: Wikimedia Commons.